For certain self-righteous and close-minded individuals, television is often referred to as the "idiot box" - to them it's a nightmarish contraption aimed solely with wasting time and dumbing down it's audience rather than dispensing any type of culture or wisdom. These people, I am quite certain, must never have heard of Barney Stinson - the wise sage (portrayed by the endlessly charismatic Neil Patrick Harris) whose appearances of How I Met Your Mother are filled with unrelenting waves of advice and philosophies on how a modern man should conduct himself in contemporary society. Whilst a lot of his advice, particularly that relating to gender politics, may be a bit askew, his monologues, off the cuff remarks, and soliloquies are never less than captivating and incredibly insightful in illuminating the mindset of a certain strand of modern men. Perhaps, out of all the advice he has dispensed with regards of "being a bro", the words of wisdom which we should all hang on to and relish the most is his continuous proclamation to "Suit Up!" Regardless of his many flaws, and indeed Stinson is both immoral and insecure behind his outer bravado, it cannot be denied that his sartorial wisdom is completely on the money - his refusal to be seen in anything but a suit give the initial impressions of a confident, dapper and sophisticated gentleman (and, as they say, the first bite is with the eye). By sporting an array of high quality suits, Stinson is able to stand out from the crowd - most of his generational contemporaries will frequent the same bars sporting jeans and trainers, giving Stinson an immediate upper hand. Studying Barney's approach to clothing, it's possible to glean an array of fantastic tips we could apply to our own style. The first lesson is to identify a particular look and work out how to achieve this rather than simply buying a suit off the hook. As Barney has a lean, svelte figure, he dresses appropriately choosing slim-line rather than boxy suits to accentuate his frame; he wears his suit rather than letting it wear him (note, also, how he prefers a skinny rather than fat tie for further accentuation). Similarly, it should be noted that rather than sticking with monochrome, Stinson is not afraid to interject patterns and colours into his ensembles to shy away from the sobriety which black and white pairings often project - his colour scheme suggests an approachability and warmth. Like all fashion-conscious young men, he also realises the importance of accessorising and adding finishing touches to his attire - high quality footwear, such as men's shoes from John Lewis, can go a long way to completing a look and a fondness for pocket squares also shows an impressive eye for detail. So, whilst many elitist snobs may decry television in general, and American sit-coms specifically, it's possible to retort that many more lessons in style can be learnt from a night sat staring at the idiot box than in the company of Madame Bovery for example. - "Suits are full of joy. They’re the sartorial equivalent of a baby’s smile." - "A week? That’s like a year in hot girl time." 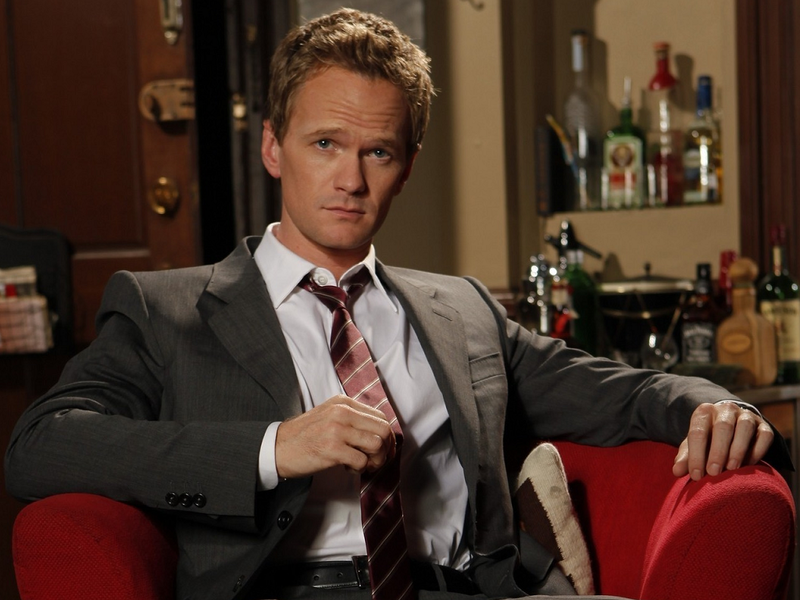 - "To succeed you have to stop being ordinary and be legen—wait for it—–dary!" - "When I'm sad I stop being sad and be awesome instead." - "Remember, it’s not about scoring. It’s about believing you can do it, even though you probably can’t." - "One of the 24 ways women and fish are alike is that they're both attracted to bright objects. Don't you ever read my blog?" Despite all his sexist comments I do have a soft spot for Barney. He is both hilarious and well dressed which is indeed a killer combination. So many quotable lines as well! Ted fast become my least favourite character as he is just so wet. Haven't watched it in a while but the earlier seasons were great. And I love Lily and Marshall!